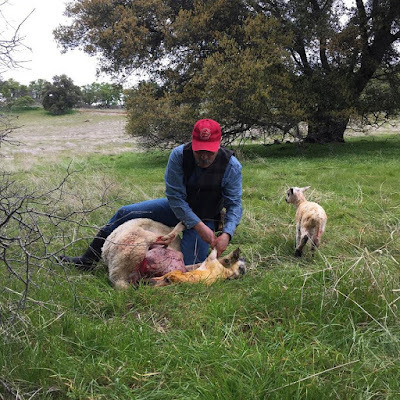 Nearly a decade ago, I had put myself on a path to become full-time sheep rancher. We had approximately 300 ewes with plans to grow a larger flock. We were selling lamb, mutton and woolen goods at local farmers markets (as many as four per week in the summertime). We had targeted grazing contracts in the spring and summer. And we were barely treading water financially. By 2012, when our 1,000-year drought hit, I'd taken a part-time job in town. In 2014, in the depths of the drought, we sold more sheep - the combination of lack of grass and increasing demands from my off-ranch jobs forced us to downsize further. Today, with a full-time job and improving forage conditions, we're building our flock back to 100 ewes. My heart is in raising sheep at a small, commercial scale. And my head has accepted that this is possible only because I do (and love) work other than raising sheep. The popular literature about modern, small-scale farming suggests that diversity of production and focus on local markets are the keys to economic success. Many writers recommend marketing meat rather than livestock as the key to improving ranch viability. Cutting out the "middlemen," these writers argue, keeps more money in the farmer's pocket. My heart wants to believe these recommendations. A small, diversified farm (with both crops and livestock) matches the romantic notion of farming that I suspect many of us have, including me. Feeding my community feeds my own sense of self worth. At least for my family, however, feeding my community did not pay our bills. Intellectually, I've come to understand that scale of operation is important. We need about 2 acres of unirrigated rangeland and a half an acre of irrigated pasture per ewe to feed our flock for a year. We need about 800 ewes to generate enough revenue to support the business, pay our family's living expenses, and provide me with a full-time income. Doing the math, this would suggest that we'd need a land base of 1,600 acres of rangeland and 400 acres of irrigated pasture for our "small" family ranching enterprise. Every farm or ranch rubs up against these limits of biology - an acre of land will only produce so much grass (or so many vegetables). Intellectually, I've also come to realize that middlemen play an important role in our food system. Direct marketing takes a tremendous amount of time. During the summer that we went to four farmers markets each week, I was spending 31 hours per week either at a market or driving - and this didn't include the weekly trips to my meat locker to pick up product, or the monthly trips to the processor to deliver lambs or pick up meat. This also didn't include the 40-50 hours per week I spent actually ranching - moving sheep and irrigation water, mostly. Now that we've changed our marketing strategy to sell live lambs at auction or to a processor, the proportion of our total revenue that we can count as profit has improved (even though our total revenue is lower). We're letting the marketing experts do their job, which has allowed us to focus on our work of raising sheep - all the while, improving the financial strength of our business. Ultimately, I've concluded that if I can't make a profit selling a live lamb, selling meat won't make my business profitable. These realizations, at least for me, didn't come as an epiphany - rather, they were a gradual turning. I struggled with the recognition that I couldn't achieve my heart's dream of becoming a full time sheep rancher. I felt like taking an off-ranch job meant that I had failed. I worried that I was becoming the grumpy late-middle-age rancher that my enthusiasm for and commitment to small-scale, diversified farming was supposed to prevent. As I taught others about the economics of farming, I felt like I was throwing cold water on their dreams if I brought up my own economic realities. Today, I understand that my situation is not unique. Most of the established family-scale ranching businesses I know require at least one family member to work in town. Most of my ranching colleagues raise livestock because they love the work - and many understand that the economics of their life's passion are marginal at best. I've come to realize that those who write about their economic success, for the most part, are working in situations unique to their regions and particular abilities. Rather than the grumpy, late-middle-age rancher who tells newcomers why their dreams won't work, I hope I've become a reasonably clear-eyed mentor that can help a new generation of small-scale ranchers become economically successful doing what they love. "We go through the annual passage of birth and death, triumph and heartbreak, love and exasperation, mud, milk, mucus, and blood. Yet once more the young ewe stands with her lambs in the dawnlight, the lambs well-suckled and dry. There is no happiness like this." My head, finally, understands what makes my heart sing. And my heart, now, accepts that my head knows that I need to get paid for my work. ENJOYED THE ARTICLE, ESPECIALLY THE POEM. Thanks! If you haven't read Wendell Berry, I highly recommend him!